High-protein, grain-free CORE Puppy food has turkey, chicken and herring that can help support higher energy and growth needs. It’s balanced with Menhaden fish oil and fruits and vegetables to help support inner wellness. Turkey, Chicken Liver, Chicken, Turkey Broth, Herring, Chicken Meal, Menhaden Fish Oil, Carrageenan, Guar Gum, Carrots, Sweet Potatoes, Kale, Broccoli, Spinach, Parsley, Apples, Blueberries, Ground Flaxseed, Potassium Chloride, Salt, Chicory Root Extract, Yucca Schidigera Extract, Dried Kelp, Alfalfa Meal, Iron Proteinate, Zinc Proteinate, Choline Chloride, Vitamin E Supplement, Cobalt Proteinate, Copper Proteinate, Manganese Proteinate, Sodium Selenite, Thiamine Mononitrate, Biotin, Vitamin A Supplement, Potassium Iodide, Vitamin B12 Supplement, Vitamin D3 Supplement, Riboflavin Supplement. 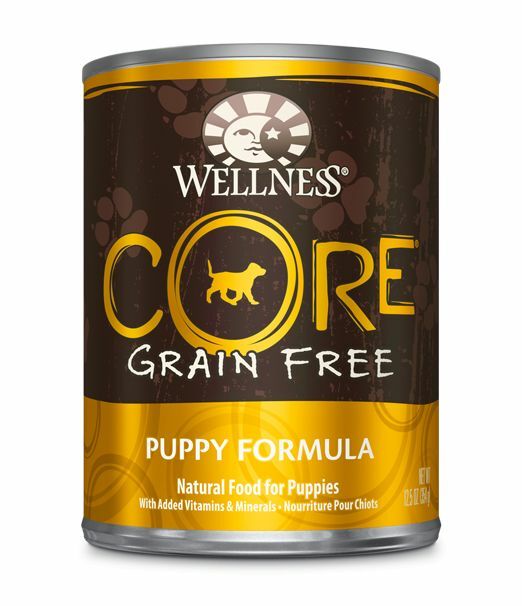 Wellness® CORE® Puppy Formula Dog Food is formulated to meet the nutritional levels established by the AAFCO Dog Food Nutrient Profiles for growth.